When we start looking back through our family trees, most of us have family members here and there that have served in the military. For some families, it's a sibling, a parent or grandparent, or perhaps you were the one who served. Some families have a history of generations of military service while, for others, having a family member serve in the military may be a totally new experience. Whichever scenario above describes your situation, one thing is for certain—it feels different when it's your son or daughter who joins the military. Somehow, thanking Uncle John for his service pales in comparison to the emotions you'll experience as the parent of a soon-to-be Marine. And this is where the rollercoaster of emotions begins. Some of us experience pride right away. Some of us experience fear right away. Some of us experience relief right away. Still others may experience disbelief, commitment, sadness, joy, or disconnection. Sometimes, the emotions change from one day to the next, perhaps even from one hour to the next. But, there's another certainty—the range of emotions and the changing emotions is something that the parent of every military recruit goes through. 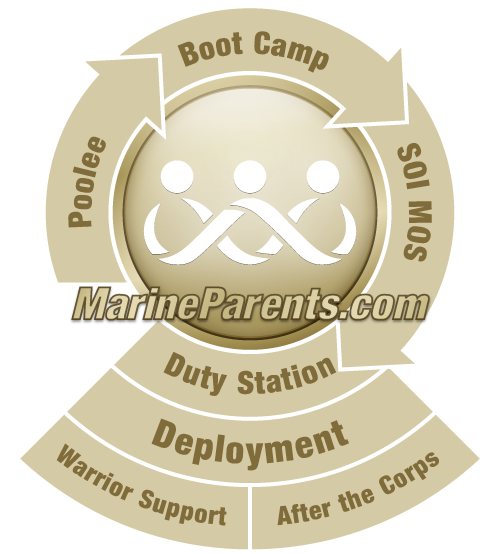 Remember, your child chose to join the Marine Corps. That, in itself, brings with it another range of emotions. Most of us either know or learn pretty quickly that the Marine Corps claims to be a unique branch of the military. The honor, courage, and commitment that everyone talks about may, at times, seem out of place when your emotions are on the down side of the emotional rollercoaster. But, at some point in time during your journey as a recruit parent, you'll read something or see something that will heighten your sense of understanding the pride of the Corps, and you'll "get it". That captivating moment may be as close as you'll get to understanding the sense of service and commitment that your child felt when he or she signed on the dotted line with their Marine recruiter. During recruit training, you'll have thirteen weeks to connect and share with other family members using the message board communities here at Recruit Parents. You'll hear their stories of pride and fear and journey along with them to gain insight on what it is to be a Marine Parent. You'll learn about the importance of the Marine Corps Birthday on November 10. You'll learn what it means to hear "Every Marine a Rifleman". You'll learn the anecdotes from Marine Corps history that have created a truly unique band of brothers. It can be difficult to understand how we can go from pride to fear and back again in the span of a few hours. But what you'll learn along the way, is that the pride prevails in the Marine Corps family, and with the pride comes the honor, the courage and the commitment. The Marines use the phrase "Semper Fidelis" with one another, which is Latin for "Always Faithful". To that, we say to you Semper Familia—Always Family. Welcome to the family. While sadness does not negate pride, my guess is that most parents experience some sense of sadness when their child leaves to go to recruit training. It means there is a risk that the child may one day end up a military hero (dying an early death) and - at a minimum - will be away from contact with the mom and/or dad for the duration of boot camp. That is sad even if nothing bad or harmful happens while the child serves his or her country.